GUMICS models the dynamic effects of changing solar wind conditions in the near-Earth space. It is a global, three-dimensional magnetohydrodynamic simulation model of the Earth's magnetosphere, and it includes an electrostatic ionosphere model. GUMICS stands for "Grand Unified Magnetosphere–Ionosphere Coupling Simulation". The code has been developed at the Finnish Meteorological Institute since 1993. Currently there are two versions in use: the serial version GUMICS-4 is an established research tool, and the real-time-capable parallel version GUMICS-5 is currently being finalised for operational space weather modelling. An illustration of the magnetosphere as simulated by GUMICS-4. Colouring on the XY and XZ planes represents plasma density, yellow lines are magnetic field lines and light-blue lines are plasma flow lines. The high-density plasmasheath can be recognised by the blue colour and the low-density magnetotail is shown in white and red. Embedded in the lower left corner is an image of the ionosphere, with colour representing electrical conductivity. Higher conductivity on the dayside and in the auroral oval are clearly visible. GUMICS operates in GSE coordinates (Geosentric solar ecliptic) and in SI units. 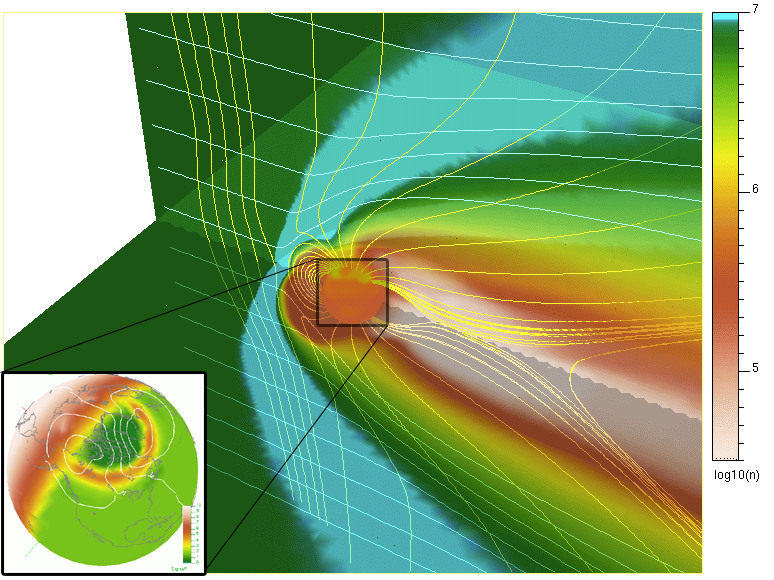 The simulation covers most of the Earth's magnetosphere, including the magnetosheath and some upstream solar wind. As input it requires solar wind density, velocity, temperature and magnetic field components. These can be either taken from satellite measurements for real event simulations, or created artificially for simpler test runs. The output consists of magnetohydrodynamic plasma parameters, and the post-analysis tools include e.g. visualisation and field line tracing. The magnetospheric domain is coupled to a two-dimensional electrostatic ionosphere model. With resolution down to 180 km in the auroral oval region, it models the ionospheric conductivities, electric currents, precipitation and electric potential.